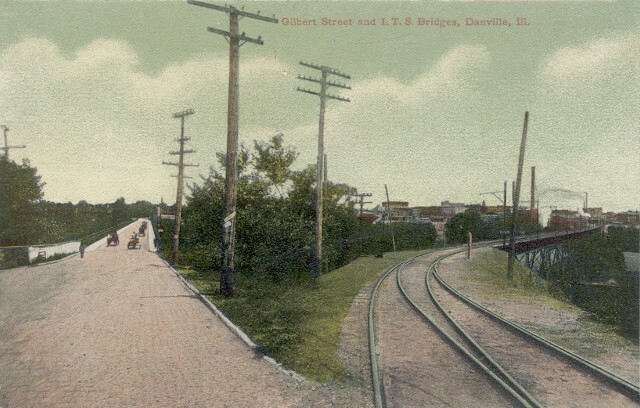 To replace the Gilbert Street bridge for the suburban/interurban lines to Catlin, Georgetown, Ridge Farm, and other towns south and southwest of Danville, the ITS built a long, substantial bridge running diagonally from south of downtown Danville southwest to S. Main Street in S. Danville. These pictures show the southwest end of the approaches to the actual bridge. The top picture looks slightly east of north. 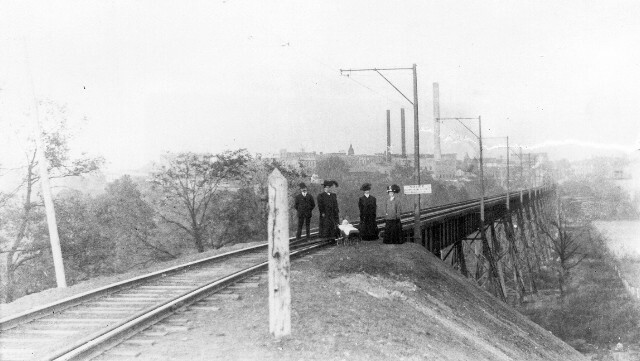 The non-rail bridge to the left is the Gilbert Street bridge, either the one seen in Picture 16-4 with tracks removed, or its later replacement. The tracks to the right lead to the diagonal bridge. The second picture looks toward the northeast from the southwest end of the bridge.